One of my news years resolutions was to make sure I didn't miss ANY family birthdays. I did really good the first part of last year, but petered off towards the end. (I always called them, it's just that getting a card made and sent out sometimes was a little much.) So, I spent a Friday night and made birthday cards for everyone in one night. Now I just need to put them into envelopes and I'll be ready for an entire year of birthdays! Below are two of the ones I did. To keep it simple I used the same layout and just switched the papers depending on who it was for. I used a layout from my Project Recipe Book. You can read more about the project book by clicking here. 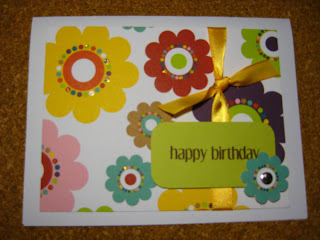 It's a great tool to have and makes it super easy to create cards and scrapbook pages! 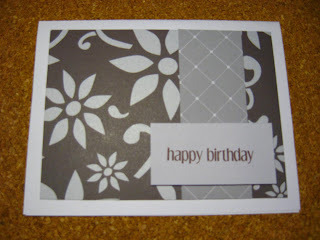 The Happy Birthday sentiment is from the Hey Cupcake set. Get ready for some Valentine's Day crafting next week! Great idea about making the cards you need for the year all at the same time! Sorry for the delay, but it's worth the wait!